With the advent of 3D printers revolutionizing a wide spectrum of art forms and mediums, artists everywhere are starting to look to the new technology as a tool for creativity. 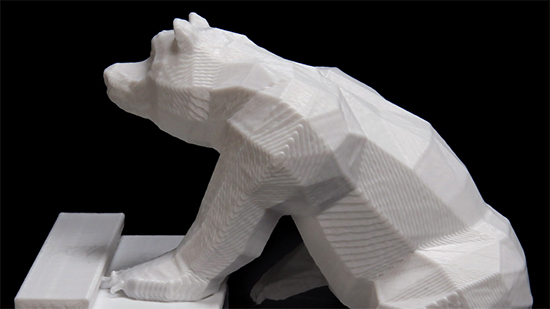 London-based companies DBLG and Blue Zoo have recently collaborated to take 3D printing to a whole new level by applying it alongside stop motion with their new work, titled “Bear on Stairs”. They have also released a short video, detailing the process behind creating this short animation loop, along with showing off the 50 models that needed to be printed to make this seamless animation a reality. The project took over 4 weeks, as models were printed and painstakingly photographed, but the end result shows off the possibilities that 3D printing can bring to the animation field.